I hope ya’ll like carrying rolls of quarters around DC, because those of you who park at meters (like me) will need twice as many thanks to the doubling of meter rates in the District that was voted on by the council. While this is certainly one way to help increase revenues in this difficult financial time, I just wonder if we’ll either see a rash of “jammed meters” or vandalization similar to this one. I do know that right now, instead of paying $21 for a garage near one of my clients in Penn Quarter, I’ll sometimes risk a parking ticket because it’s only slightly more expensive. That’s probably an awful admission, but I think raising the parking fines might’ve been a better solution. We’d know that, if the council had done any research on what other trends are showing, but they didn’t, and just raised the prices. Yes, what a terrible thing the council has done here, pricing a scarce commodity to be more in line with its real value and all. Why won’t anyone think of the put-upon Virginia drivers!? 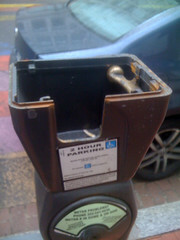 How can you compare garage parking with meter parking – its not like its $21 to park for two hours on the street now. Meter parking is for short stops, garage parking for full day car storage. Tickets for those that try to use one for the other. And yeah, I think they should raise parking tickets too. MAN!!! >-$ WHO CARRIES all that damn CHANGE! AT LEAST MAKE THE METERS ACCEPT Credit CARDS!!! It would great if DC would get something like an iPark. I agree with you, DCBuppie. Arlington is installing the credit card accepting machines, and I’m delighted. I don’t mind paying for my spot, but I rarely carry change and I’d love it if our parking payment technology could catch up with common modern methods of commerce.